I’ve always been interested in fighting the corner for typical workplace / classroom enemies so this time I’ve decided to return to the topic to defend doodling. It seems like a natural instinct to most of us, even if that’s just absent-minded sketching in the event of holding a pen, but does its popularity explain why do we do it, where does it originate from and what good, if any, is my swirly robot-cat? 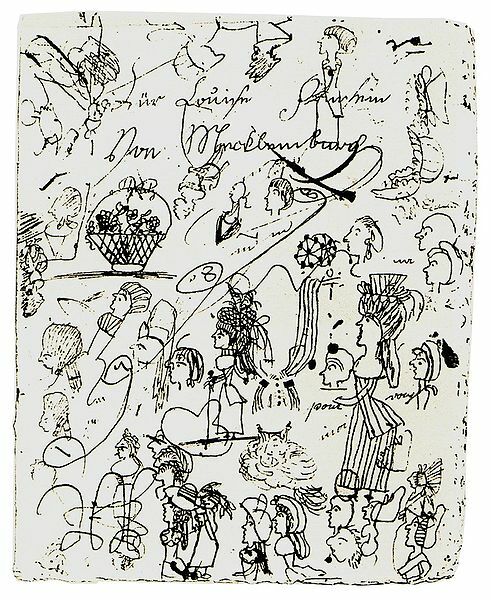 Some early written languages rely upon sketches while ancient paintings show humans have always possessed the need to visually represent their thoughts to communicate and consolidate ideas. This alone suggests doodling is not just driven by boredom but also by instinct. To fully absorb information it is said that two ways of processing information (either visual, auditory, reading and writing or kinaesthetic) have to be engaged. The ancient artists of cave paintings would have constantly been alert to the task at hand and nearby danger too, suggesting we are not meant to concentrate on one task without being aware of surrounding activity. This is seen in our modern lives as some feel their focus sharpens with background noise, so they go to a café to work or have the radio on low while revising. Doodling seems to be an instinctive way of keeping focused – the brains way of creating background chatter by allowing us to, for example, draw while listening in order to fully process information. Pretty good for a timewasting habit! In recent years the cognitive science of drawing has begun to receive some of the attention which was previously focused on neuroaesthetics, bringing research away from how we appreciate the art of masters to the significance of our own simple doodles. A small investigation by the University of Plymouth asked ‘Does it improve or hinder attention to the primary task?’ To investigate they were asked to spend five minutes listening to a dull voiced mock telephone message about a birthday party and were told to write down the names of those who would be attending. Half the group was allowed to doodle while the other half was told only to write down the relevant names, all while sifting through irrelevant information about rainy getaways to Edinburgh, museums, a house near the south coast and kitchen redecoration plans. At the end ‘the doodling group performed better on the monitoring task and recalled 29% more information on a surprise memory test’. Though a small study, it supports the idea that doodlers actually remember more when asked to retain monotonously delivered information (and I’m sure that you can recall many meetings or lectures when that would have been helpful). Sunni Brown, author of The Doodle Revolution, begins her TED talk with the unflattering definitions of doodling through the ages; from a fool to a swindler and today meaning to dawdle or do something of little value. Despite this she separates the typical perception of doodling from new ideas to conclude ‘doodling is really to make spontaneous marks to help yourself think’ and should be viewed as a help rather than hindrance when creating and consolidating thoughts and information. Next time you’re in a meeting, lecture or the ‘just one minute’ hold on the phone runs into an hour, doodle your way to creativity and renewed focus by letting your pencil roam.